It's easy to see why the report on Burlington's livable wage ordinance — ordered by the mayor last November — was issued at 2 p.m. last Friday. Politicians know that's the best time to release embarrassing information and thus bury a damaging news story. Sure enough, the 55-page report shows the ordinance has gone almost entirely unenforced during the nearly 12 years it's been on the city's books. Of 160 municipal contracts subject to livable-wage provisions, just 23 — or 14 percent — were found to be in full compliance with the ordinance. And 19 of the 23 conforming contracts came into compliance only after the city began its review early this year. Mayor Miro Weinberger ordered the review after the city’s Board of Finance issued a controversial exemption from the wage rules to the Skinny Pancake restaurant for cafes it’s operating at Burlington International Airport. Skinny Pancake owner Benjamin Adler persuaded city officials that paying his workers according to Burlington’s livable wage would significantly increase prices for airport customers. "No restaurant pays their dishwasher $17.71 an hour," Adler told Seven Days in November. "It's not sustainable." The Skinny Pancake is in full compliance with the ordinance because it received the exemption. Failure to pay a livable wage is defined in the ordinance as a civil offense subject to fines up to $500 for each day a violator remains out of compliance. But the city has not penalized any contractor in response to this flagrant flouting of its rules. It's unlikely the city was even aware that contractors were out of compliance in most cases or that department heads weren’t enforcing the ordinance. "For most of the city, there is no mechanism or personnel to actually do the monitoring contemplated by the ordinance," says the report prepared by the office of City Attorney Eileen Blackwood. The livable-wage ordinance appears to be a case of a well-intentioned initiative being largely ignored once it had been set in motion, comments Emma Mulvaney-Stanak, a former city councilor. "The city should learn a lesson from this that the devils are in the details when it comes to an ordinance being implemented," she says. 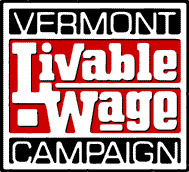 Mulvaney-Stanak and Doug Hoffer, who is now the state auditor, spearheaded a campaign that resulted in enactment of the Burlington ordinance as well as the adoption of livable-wage guidelines by the state. In an interview on Sunday, Hoffer credited Weinberger for ordering a review that recommends a series of actions that would result in meaningful enforcement of the ordinance. The mayor himself said in a statement accompanying release of the report that his administration is "committed to consistent and fair enforcement of the city's ordinances." Weinberger also noted that "as a result of the review, the city's practices have improved substantially and will continue to improve." And Hoffer says it's important to point out that all of the city's 600-plus employees do get paid at least the livable wage stipulated in the ordinance. The Burlington Electric Department is cited in the report as the one city entity that has made consistent efforts to require and monitor compliance with livable-wage standards. "BED engages many of its contractors via purchase orders, rather than full-blown contracts," the report notes, "so it has a practice of obtaining verbal confirmation" that a vendor pays its employees what the city defines as a livable wage. Currently, that figure stands at $13.94 per hour for employers who provide workers with health insurance and $17.71 for those who do not. Many city officials may not even be aware of those numbers, the report suggests. It was only within the past few months that the city developed a livable-wage web page. "Until then, it was not easy for anyone to find out what Burlington's current LW rate actually was," the report says. "Even city staff claimed they did not know the current rate until the website was created and publicized." Under pressure from Hoffer, Mulvaney-Stanak and other activists, the state set a livable-wage guideline that now stands at $12.48 per hour, but it doesn’t have the force of law. That's substantially more than Vermont's $8.60-an-hour minimum wage, which does carry the weight of law. Vermont has the third-highest minimum wage in the country — after Washington's $9.19 and Oregon's $8.95. Burlington had a higher livable wage in 2010 than all but two of 123 municipalities known to have such wage standards, the city’s report indicated. Two Silicon Valley communities — Sonoma and Richmond, Calif. — were the only ones with higher livable wages, according to a study by the National Employment Law Project cited in Burlington’s report. Just two exemptions have been granted to Burlington's ordinance, which applies to non-unionized contractors who do more than $15,000 worth of business with the city during a 12-month period and to lease holders at Burlington International Airport. In addition to the exemption given last year to Skinny Pancake, TD Banknorth was partly exempted from the ordinance by the administration of former mayor Bob Kiss in 2010. The city attorney's office itself did not enforce compliance on the part of three covered contractors until its review got underway, the report acknowledges. The office of the chief administrative officer and city clerk also had not required three contractors to swear an oath of compliance, as the ordinance stipulates. Certification was obtained in one of those cases last month, the report notes, adding that the two other contracts make "no reference to the LWO (livable wage ordinance]." The Community and Economic Development Office has four contracts subject to the ordinance. "None has a certificate of compliance," the report finds. One of the most potentially consequential enforcement failures has occurred in regard to the four major airline carriers — Delta, Jet Blue, United and US Airways — that operate under leases at the city-owned airport. "None of these include any livable wage provisions," the report notes, adding, "The airport has had to actually provide financial incentives to keep many of the airlines providing service at an acceptable rate." The four carriers are together the source of up to 200 local jobs, the report further points out. And it states: "Airline employees report to airport staff that they generally are not unionized and are not all paid a livable wage at Burlington's current rate."